I did try it. Was slightly underwhelming but given the plant is quite small and it has been struggling due to the very dry weather, it was ok. Hopefully next season will be more productive. The fruit was only the size of a chickens egg but I was just pleased that it was a pink fleshed Megalanthus variety! I am new to the forums and have been reading this thread, wow! Some of the plants on here looks amazing. I live in southern Spain and hope to get some success with these in smaller pots. I grabbed some seeds this December from a red with white flesh (name?) 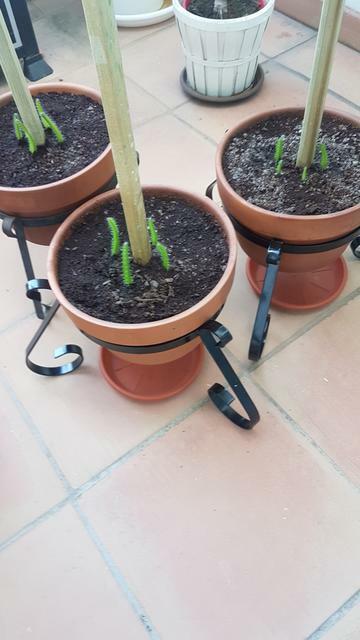 dragon fruit, they germinated and was up out of the ground around 20th of December. I have been growing them under artificial light for about 4 months now and they are about 4 - 6 inches in size. I recently transplanted them in a 3 gal pots (4ish, in 4 pots) around a wooden pole; secured from beneath the pot. 3 of those are now sitting outside receiving about 7 hours of sunlight, it will be around 10hs by June. It is really cool to see them develop so rapidly. Has anyone else had experiences growing dragon fruit from seed and how long it took for them to flower? Thanks for the info! I'm hoping it will be faster as I will be growing them inside during the winter under powerful LED lights in a controlled environment. We will see, with your comment in-mind I then take it I should consider myself lucky if I manage to get anything sooner than that? Do you know if they would flower well in smaller pots, like the 3gal I got them in now? In that case... I would estimate it will take 5+ years to get fruit. Ok! Worst case I could always replant them when they get bigger. Also, your central pole looks a little weak, the plants can get heavy when they get big enough to fruit prolifically. When you up-pot them, I'd get a sturdier pole and something for them to hang over. This megathread has a lot of good examples in it. Thanks for your input, I will probably use this current setup as a nursing station. Thinking of feeding my dragon babies up the poles and once they reach the top, replant. Just as a side note, if you have the ability at all, you might want to consider trying to acquire some cuttings of established plants. I know growing from seed seems fun, and I I'm not saying you should give up on the ones you have, but the two reasons most people grow from cuttings are, first, that you usually know the type of fruit you are getting from a piece of an established plant. With seed there is a slight chance that, through cross-pollinization and random 'birth' genetic variations, you could end up with fruit that's not the same as the plant it came from. Remember, the fruit part you eat is the 'womb' for the seeds, not the crossed offspring of the flower and pollen. The seeds are what get the genetic material of host mother and pollen father. The second reason is that cuttings give you fruit bearing plants MUCH sooner. A mature cutting can give you enough growth and flower set to bear fruit in 2 years sometimes, compared to the typical 4-5 for seedlings. I know, as I did some experimental crossbreeding early on, but got frustrated with it and just wanted to enjoy my plants. Either way, though, welcome aboard. I hope you have fun with your new plant project and look forward to seeing how things progress. Wow that is awesome information, thanks! I have considered the idea, but not in a hurry to get fruit. I like growing and learning of the different plant-life stages. Maybe you know what is happening to my seedlings? Some of them (mostly the smaller and weaker ones) has started to develop what looks to me like a sunburn(?). They have been getting full sun for about 3 weeks. I moved the pots yesterday to a spot where they'll receive 3-4 hours of direct morning sun instead of 9 or so. Has anyone experienced this before? Could it be a nutrient issue? Yeah it is sun damage. I leave mine in the shade and only receive some morning sun. Good move! Thanks! You confirmed my initial belief. After you clarified I went on to move all the pots to the shade, not just the sunburned. I'm growing some yellow DF from seeds too and some of mine got sunburned cause I let it get full sun. Now it only gets morning sun. Hi Sandy, they still grow ok in the shade? When are they old enough to go full sun? They're doing ok. They get morning sun and afternoon shade when the sun's the hottest. Since they're still seedlings, I find it best to harden it off. These are the ones that I had recently planted outside and they were in the house in front of a bright window last month. Then when they got a little bigger and thicker, I slowly let them get more sun. But I've also read that the yellow dragon are more sensitive to the cold and heat. It isn't really hot where I'm at right now. But when it gets to the 80s, I plan on just giving them morning sun and afternoon shade and that'll be a good 5 hrs of sun for them. On a side note, here's something we all like to see. Way to wake up. Lots of flowers. Holy.. that looks like an awesome onset for the summer! Did you grow them from seeds? It is amazing to see that little one by the leaves and how well it is doing. Congratulations! Rob, could you post a photo zoomed out of your support structure? And no, thats not a seedling or a start in the leaves. Its apparently a piece of a piece of a cutting that managed to escape while i was cleaning or pruining and managed to get itself established and, I assume, rerooted. I have a bit of clutter and I find 'strays' popping up all the time. I have a bit of clutter and I find 'strays' popping up all the time. Incredible job and I bet lots of fruit. BTW, do your strays that stay prone take root and grow? 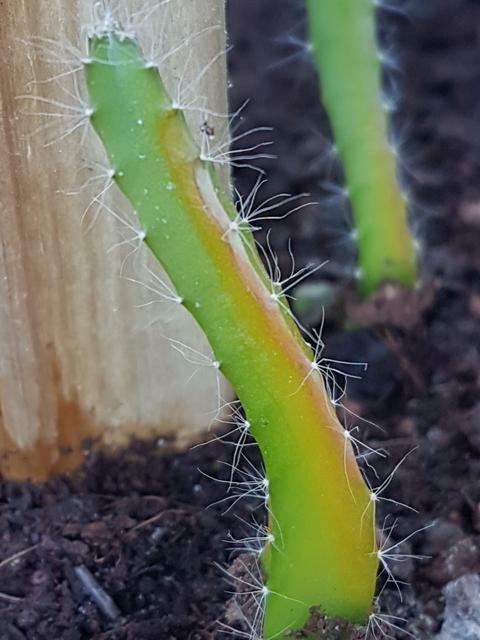 I've got some cuttings planted on their side with one rib sticking in the soil. Nice Rob. Love the walkway you created. A few days ago I hand pollinated two flowers of Physical Graffiti with its own pollen. Was done at 11pm. Made sure I put a sufficient amount in the stigma. Flowers dropped. I had no other pollen available. I have heard both, that physical graffiti es self fertile and others say it not. Any one with experience on this ? Particularly looking with successfull pollination with other cultivars.